Cut beef with grain into 2-inch strips; cut strips across grain into 1/8-inch slices. Spray 12-inch nonstick skillet with cooking spray; heat over medium-high heat. Add beef and garlic; stir-fry 4 to 5 minutes or until beef is brown. Remove from skillet. Add broccoli and 1/2 cup of the broth to skillet. Heat to boiling; reduce heat to medium. Cover and cook about 2 minutes or until broccoli is crisp-tender. 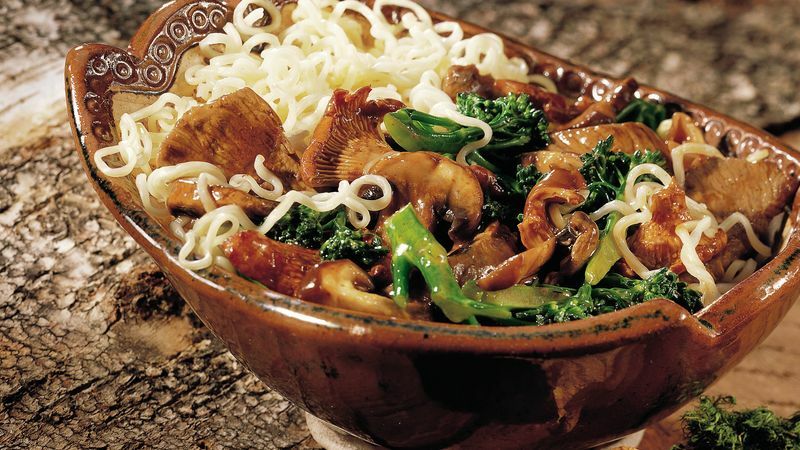 Add mushrooms, sherry and soy sauce. Cover and cook 2 to 3 minutes, stirring occasionally, until mushrooms are tender. Stir in beef. Mix cornstarch and remaining 1/4 cup broth; stir into beef mixture. Heat to boiling, stirring constantly. Boil and stir 1 minute. Meanwhile, cook and drain noodles as directed on package. Divide noodles among bowls. Top with beef mixture. Experiment with the wide variety of fresh mushrooms available in the supermarket. Try chanterelle, oyster or wood ear mushrooms for a change of pace. Save time by using already-chopped garlic available in the supermarket produce section. Use 1 teaspoon of chopped garlic for the 2 cloves of garlic.